Ever since Intel introduced their Northwood core for the Pentium 4, it renewed faith in Intel users who were skeptical to upgrade to the Pentium 4 Willamette. With the Northwood version of the P4 1.6 processor, users were able to easily overclock them to 2.2 respectively by simply bumping the front side bus up to 133 MHz, which is 533 MHz respectively. Overclockers praised and named the 1.6A “The Next Celeron 300A” due to its ease of overclock-ability very much like the Celeron 300A, which was able to run at 450 MHz by simply bumping the FSB up to 100 MHz. Bumping the front side bus to 133/533 MHz on the 1.6A allowed it to run at 2.2 GHz and also outperform the stock 2.2 GHz that ran on a 100 MHz FSB. It would only be a matter of time till Intel would finally move to a 133/533 MHz FSB as the fastest Pentium 4 is already using a 24x multiplier. Moving to a 133/533 MHz FSB would allow Intel to use a lower multiplier, scale up to higher speeds, and in the end give the user more performance for the money. While moving to the 133/533 MHz FSB might be as simple as lowering the multiplier and bumping up the front side bus, it takes time and preparation for it to be mass produced, as the Fabs have to be tweaked and setup to produce the processors with very high yields. If the yields on the processors are too low, the prices on the processors would be very pricey. This is what we saw with the original Pentium Pro, which was priced extremely high because the yields on working processors were extremely low. While Intel’s flagship Pentium 4 has usually cost approximately $600 retail, thanks to the Pentium 4’s new core, the die is approximately 10% smaller. This is due to Intel producing the new 533 MHz processors on a 300 MM wafer compared to the previous processors which were produced on 200 MM wafers. This also allows Intel to produce more processors per wafer, which in the end affects the Pentium 4’s pricing in a positive manner. 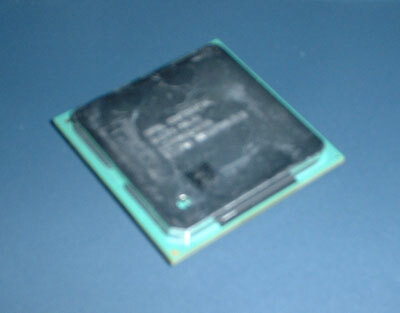 Since the dawn of the Pentium 4, Intel has always encouraged the use of the i850 chipset for maximal performance. As prices for Rambus were increasingly high at the time, Intel eventually turned to DDR for their mainstream P4 platform. Nonetheless, the i850 till this day is still used due to its unbeatable performance thus forth by any DDR solution. It’s been over a year and Intel has finally updated their aging i850 chipset. This time around the improvements are minimal, but add a lot to the chipset in terms of performance. Named the i850E, the pseudo new chipset adds support for the new 533 MHz FSB, as well as support for new PC1066 ram which will be available soon. Coupled with the P4 (533 MHz), the i850E is definitely the optimal solution for the Pentium 4, as there are no chipsets that officially support the 533 MHz FSB yet, though the SiS645DX offers unofficial support for it. I’ll cut it with the technical stuff and move onto the usual images and etc…. With the Netburst 533 MHz processors, the proc is still the same. There’s nothing different physically as you wouldn’t be able to see anything either because of the heat spreader plate that covers everything. Nonetheless the new P4’s still feature the same 512kb L2 cache, 8kb L1 cache, and 32kb trace cache as found on the Northwood. As with the i850E, the north bridge still looks the same. And yes, it’s a north bridge and not a BGA Celeron or the processor in the X-Box, though it is nearly exactly the same size. Nonetheless the i850E adds support for the 533 MHz FSB and PC1066 Rambus. As for the ICH south bridge, the current board I received still uses the old ICH2 and not the rumored ICH4 which is supposedly providing USB 2.0 support.